For background, here are the Pallimed posts from Annual Report 2007, Annual Report 2006 and Annual Report 2005, as well as a primer on confusing hastened death terms. In 2008 the number of prescriptions increased to 88 from 85 in 2007. 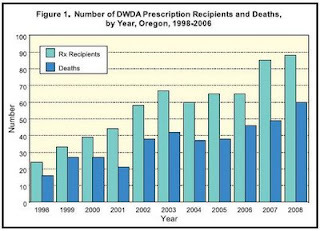 The number of deaths also increased from 2007 to a total of 60, with 6 patients taking medications prescribed in 2007. This brings the total to 401 patients dying under the DWDA since inception in 1998. The % of patients enrolled in hospice was much greater this year as well (98% vs. 86% in 2007). No complications were noted this year. Again loss of autonomy and dignity were the two main reasons for choosing physician assisted death. If you are not familiar with these issues and you are in the hospice and palliative care field, please keep your ear to the ground. We are considered to be the experts in end-of-life care and if we are ignorant of the national or regional discussions about medically hastened death, physician assisted death, and euthanasia, we risk losing our credibility as knowledgeable experts. Think about how you might answer inquiries from families, patients, colleagues, politicians and the media. Already the arrest of members of the Final Exit Network has prompted a NHPCO press release condemning the words of the lawyer for FEN equating hospice to suicide. Also Washington State's DWDA/Physician Assisted Suicide law takes effect this week. Many other bloggers are covering the assisted suicide arrests so please check them out. Georgia Case: When is assisted suicide murder? A critique of the report is found at the Euthanasia Prevention Coalition blog.